Background: Through relatively unknown mechanisms, bariatric surgery can resolve type 2 diabetes in morbidly obese patients. 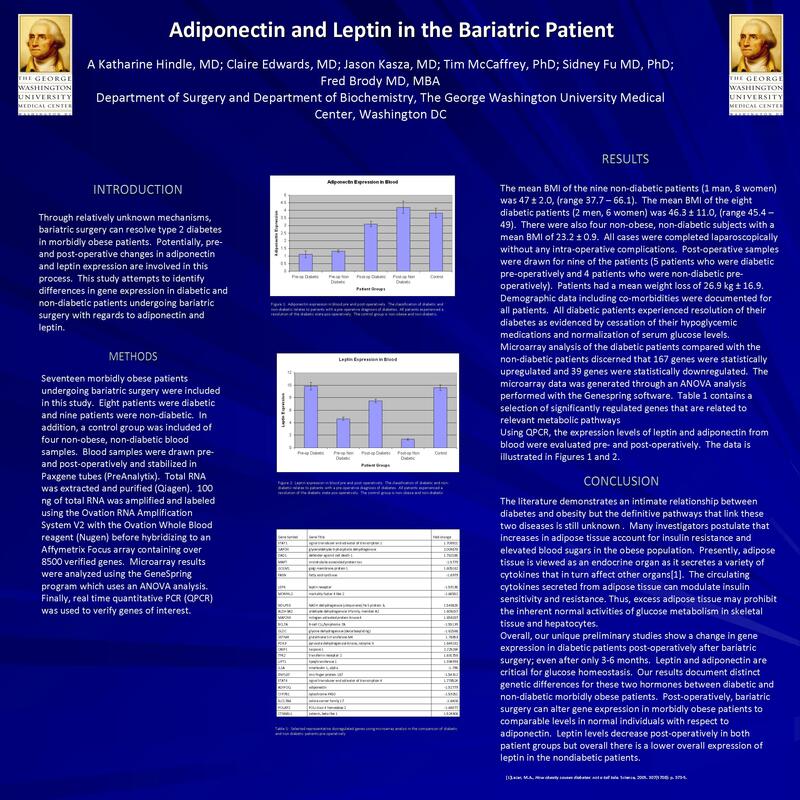 Potentially, pre- and post-operative changes in adiponectin and leptin expression are involved in this process. This study attempts to identify differences in gene expression in diabetic and non-diabetic patients undergoing bariatric surgery with regards to adiponectin and leptin. Methods: Seventeen morbidly obese patients undergoing bariatric surgery were included in this study. Eight patients were diabetic and nine patients were non-diabetic. In addition, four non-obese, non-diabetic blood samples were included. Blood samples were drawn pre and post-operatively and stabilized in Paxgene tubes (PreAnalytix). Total RNA was extracted and purified (Qiagen). 100 ng of total RNA was amplified and labeled using the Ovation RNA Amplification System V2 with the Ovation Whole Blood reagent (Nugen) before hybridizing to an Affymetrix Focus array containing over 8500 verified genes. Microarray results were analyzed using the GeneSpring program which uses an ANOVA analysis. Finally, real time quantitative PCR (QPCR) was used to verify genes of interest. Results: Overall, 167 genes were upregulated and 39 genes were down-regulated in the obese diabetic patients versus obese non-diabetic patients. Pre-operatively, adiponectin was down-regulated 1.5 fold for diabetic versus non-diabetic patients. Leptin expression was not different between the two groups. However, post-operative leptin expression was up-regulated 2 fold using QPCR Of note, post-operative leptin expression was similar to leptin expression in non-obese, non-diabetic patients. Conclusions: Leptin and adiponectin are critical for glucose homeostasis and there are distinct genetic differences for these two hormones between diabetic and non-diabetic morbidly obese patients. Post-operatively, bariatric surgery can alter gene expression in morbidly obese patients to comparable levels of normal individuals.